Just got home from a three day trip to the Buffalo river in northwest Arkansas. What a blast! Ready to go back! The river was up and flowing good, the fishing was excellent, we tore em up both days. Not a lot of big ones, two that went over 15″ and we lost count on all the Smallies and Goggle Eyes. 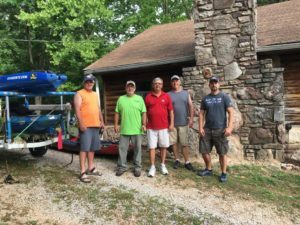 Thanks Randy”Cisco” Collier, Nathan Collier, Shannon”Otto” Gilbert, Steve “Rok” Hayes and Brian “Beer Belly” Clark for another perfect float trip, can’t wait until our Fall trip! Stay safe everyone, wear your PFD’S! TEAR EM UP!! We like to honor numerous other net web sites on the internet, even if they arent linked to us, by linking to them. Under are some webpages worth checking out. Please visit the web sites we comply with, including this one, because it represents our picks in the web.